Are you or someone you know suffering from abortion? There is hope and healing. “If you have suffered the pain of abortion like myself, there was still something missing in my life… I felt such shame, so unworthy of happiness and peace, no matter what I tried to do, there was still a huge hole in my heart. Someone had suggested that I go on a Rachel’s Vineyard retreat. Although skeptical I did and I’m here today healed, hopeful and amazed of how God’s mercy and love have continued to affect my life. Many of us have been affected by the pain of abortion. You do not need to live this way anymore. There is hope and healing available. The Rachel Ministries can help."
. More information available at racheldallas.org. Gather to pray for those individuals facing execution in Texas in the coming month, as well as for the victims of violent crimes.
. Sponsored by St. Elizabeth of Hungary Parish. "We have an urgent need for a family to adopt 4 boys who were relinquished by their birth parents yesterday in Richmond, TX. The adoption would be done through Family to Family (http://fam2fam.org/), which is the agency where the children were dropped off. The boys are biological Hispanic brothers, ages 8 months old, 3 years old, 4 years old, and 9 years old. * The parental rights have been terminated, so they are ready for adoption. Family to Family would only charge 1 agency fee rather than 4. They prefer to keep the boys in Texas, and prefer to keep them together. However, they are willing to split them up if needed. What they need most is a loving family. A family who has their home study ready, or close to ready is preferred so that they can move forward with the adoption quickly. The boys are currently split up into various short-term housing situations. The 9-year-old is currently in a foster home in Sugar Land. The 3-year-old is currently with a case worker from Family to Family, and the 8-month-old and 4-year-old are currently with a family member of a case worker from Family to Family. Again, all of these are short-term arrangements, and we need to get these boys into an adoptive family as soon as possible! The 8 month old is said to be a typical 8 month old. The 9 year old is said to be very smart (an "A" and "B" student) and sweet. The 3 and 4 year olds both show signs of neglect (will gobble down food fast as if they don't know when the next meal will come), and will need some extra time and care to build trust." Both the 9-year-old and 8-month-old have been adopted. The 3-year-old and 4-year-old are still waiting for forever families. They are thriving in foster care after neglect. The boys are full biological brothers and both are autistic. If you are interested in adopting these boys, please contact Jennifer or Debbie at Family to Family (281-342-4042). Evil, given a foothold, only advances, never retreats. . . If we dismiss Gosnell as an aberration, one bad apple in a barrel of good abortionists, how do we explain the cascade of ordinary people tumbling out of this story who looked away when they saw his atrocities? Who stood next to him, helping, as he “snipped” babies’ spines? Or worse, followed his lead and committed the same despicable acts themselves? 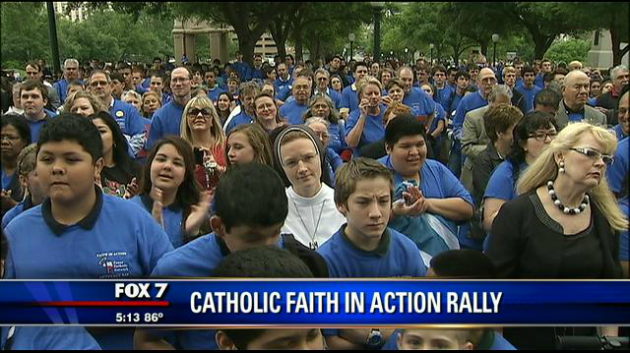 The Capitol served as a backdrop for a couple of thousand Catholics who came to Austin. Tuesday's gathering was a stand of faith for the church as much legislation going through the Capitol affects the Catholic Church. Lawmakers were able to see firsthand thousands standing as one.